Join CeCe Winans, her electrifying 5-piece band, and a host of singers for a night of exuberant praise and intimate worship! Recorded live in Nashville, the DVD includes 90 minutes of dynamic worship, behind the scenes footage and special bonus features. About "Live in the Throne Room"
What started out as a 25-city church tour with no ticket admission evolved into an evening of exuberant praise and intimate worship captured on DVD. The demand for "The Throne Room Church Tour" has been massive. The desire for the opportunity to experience this service personally increased to a level not humanly possible to achieve. Thereby, the need to capture this event in a format so individuals and congregations could experience "The Throne Room" was a necessity.^^Recorded before an enthusiastic crowd of worshippers at Cornerstone Church in Madison, TN. 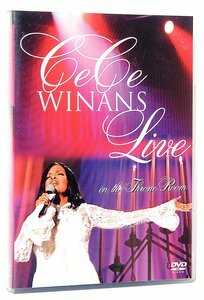 Grammy Award Winning gospel superstar CeCe Winans and her electrifying five-piece band and singers presented a set list that included music from her latest praise and worship CD "Throne Room" as well as popular songs from her vast repertoire, including "Alabaster Box" and "Everlasting Love." Over the years, music critics have marveled at CeCe's dynamic stage presence. They gush over her vocal audiences. This recording exemplifies nothing short of that but takes on another dimension as she pours her being into leading others into the presence of God. :Join CeCe Winans, her electrifying 5-piece band, and a host of singers for a night of exuberant praise and intimate worship! Recorded live in Nashville, the DVD includes 90 minutes of dynamic worship, behind the scenes footage and special bonus features. Winans is one of contemporary music's most acclaimed vocalists. As one-half of the award-winning duo BeBe and CeCe, she garnered unprecedented acceptance in both R and B and Christian music circles. In 1995, she released her first solo project, the Grammy Award-winning album "Alone in His Presence." She is the host of the Odyssey network's television show "CeCe's Place."